Progress Lighting Inspire Collection 2-Tier chandelier uses nine 60-Watt incandescent lamps. Candelabra phenolic socket lamp has voltage rating of 120-Volts. This traditional/casual chandelier has brushed nickel finish and steel construction. 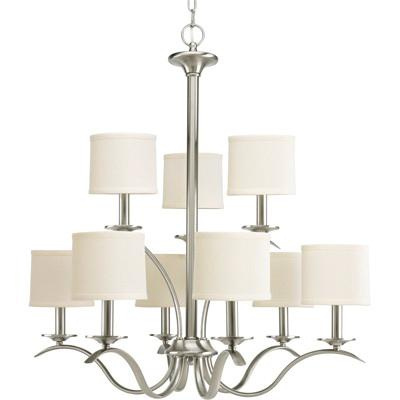 Off-white linen drum shade of this chandelier brings elegance to the home. This chandelier has 6-ft long chain/stem and 12-ft lead wire for hassle-free installation. It is ideal for dining room lighting and/or hall and foyer lighting. Chandelier is UL/cUL dry location listed.